Today is the 5th Annual Pet Blogger Challenge, hosted by the people over at Go Pet Friendly blog. Eighty-two bloggers participated last year. We weren't one of them, so we made sure we penciled it on our calendar for 2015! 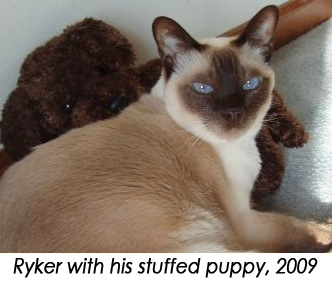 We began blogging in 2010, when Ryker was still around. He's the original Tonk that A Tonk's Tail was named after. You can read his rescue story in a new anthology book to be released just two weeks from now. The book is called Rescued, and a portion of the book's proceeds go to 12 different rescues across the globe! 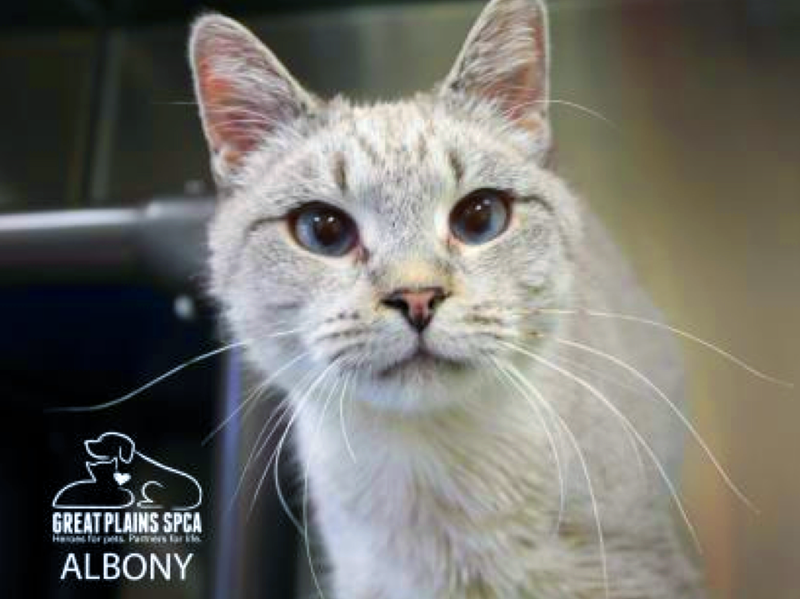 We shared with you on New Year's Day a look back at the adoptable cats we featured in 2014, and we hope that the 78 cats that found their homes might have been helped a tiny bit by social media spreading the word! We're also grateful for the sponsorship opportunities that came our way last year, because it enabled us to donate a lot more financially to some very needy shelters. Be genuine. Be real. Be sincere. Share your heart and the things you are passionate about. Consistency, a presence on other social channels, and - most important - interaction with our friends and readers, both here and on other blogs. 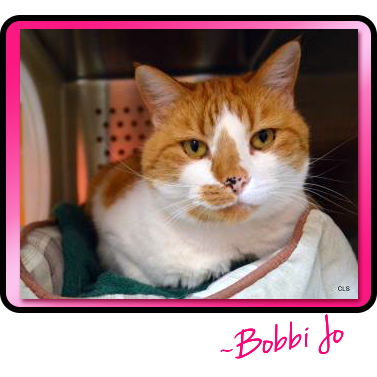 The post with the most views was a feature on an adoptable cat at Allie's Alma Mater: Bobbi Jo. Although we're gratified that she received such attention, we suspect it may have more to do with a google search on her name than interest in adopting her (even though she is a stunning marmalade girl!). I think I'd have to choose our new PeeMail series. The cats email me every time I travel. I'm getting such a kick out of this! There's just something about that one photo of Faraday getting his mad on that makes me giggle every time I see it! No, back in 2013, I decided if I was going to expend the time and effort to stage and style photography, and then write reviews that actually researched beyond what the company provided...I would be paid to do it. I do worry, though, that our niche is so small and specific that companies don't value our worth. If they are looking for CPM, they simply won't find it. Our readership is too small compared to those of lifestyle, fashion and food bloggers. If they're looking for a quality, targeted audience however? BINGO. 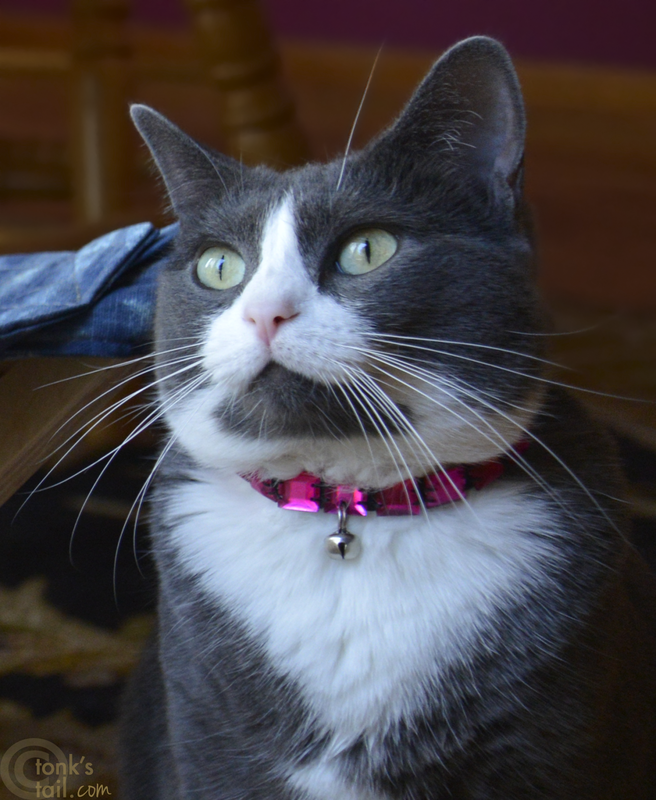 They're found the way to reach them: pet bloggers! This is the film director speaking: be as organized and consistent as you can. This is the personal side speaking: do it only as much or as often as you wish - and only so long as it brings you pleasure. Our sweet Maxwell is a heartthrob, don't you think? To try to maintain the quality of the content yet find a way to better manage the work/life balance. I've been working on the blog nonstop over the holidays and that much concentrated work isn't tons of fun. I'm still shying away from the elephant in the middle of the room: WORDPRESS. To migrate or not? EEK! Be sure to check out the other blog writers participating in today's challenge at Go Pet Friendly's page here. Thanks for reading our responses to the Challenge! Wow, these are great, thoughtful answers... and they gave me some things to ponder, even though I'm not participating this year. We enjoyed reading your answers. 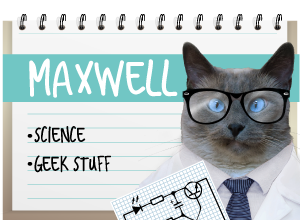 Yes, Maxwell is a total heartthrob! It's not to meet you. Your answers are great, and I am so in agreement with them. Especially the write what you want to. Beautiful cats and nice blog too. Glad I got to visit on the blog hop. Darn, we forgot about this challenge. We'll make sure to calendar it for next year. We didn’t find out about the challenge until last night. Darn! You don’t want to go to WordPress. I know some who have migrated there and come back to Blogger. Yes, shorter blogs are more popular. I’ve tried to be briefer. Sometimes it works; sometimes no. You peemail series looks really fun! 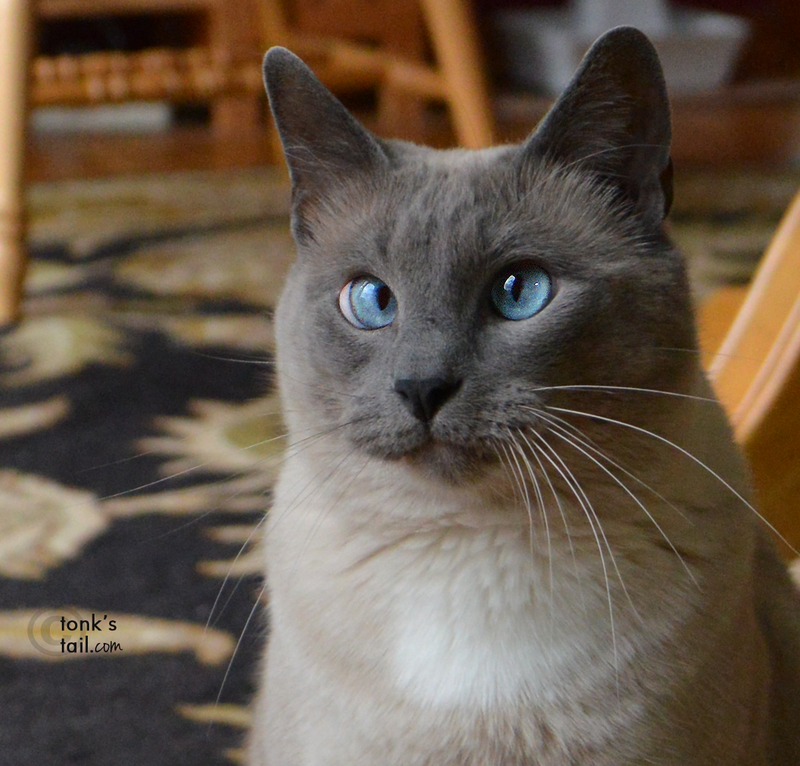 Wow, 78 cats shared on your blog? That's awesome! I'm a crazy dog lover (and I foster them too). But I know the greatest need is finding homes for cats. I've been on WordPress since the beginning so I don't know anything about Blogger. But why don't you start a group on BlogPaws asking others about it? I've seen several people raising the same question. You might be able to help each other figure out if it's worth your trouble. BTW, I love the idea of your PeeMail feature. That looks adorable. Great post! I think that PeeMail photo is pretty funny too. Something about kitties making funny faces gets me every time. It is amazing that so many kitties from your list were adopted! That is very pawsome. I'm on Wordpress and I have been since the very beginning. It seems like the biggest difference between Wordpress and Blogger is just that some people are used to one and other people are used to the other. In the end they both can produce outstanding blogs. If you ever decide to switch to Wordpress and need help with Wordpress, feel free to drop me a line. As for the WordPress question? DON'T DO IT! I have a WordPress blog (my dog's blog) and a blogger blog (Cody's), I MUCH prefer Blogger! I definitely say YES, migrate your blog to WordPress. I was on Blogger for a long time and I was comfortable and happy there. But I've never regretted moving to WordPress, and I'm also very happy there but with so many more options for my blog. It's great that you have been able to kelp so many kitties. While my blog niche does not include rescue (unless it directly applies to Gretel's history) I do try to help by volunteering and donating. I love all of your kitty pictures. It's been a long time since I have owned one. Hi there! Yes, the Pet Blogger Challenge is always on January 10th each year, and I usually post the questions we'll be answering about two weeks before that so people have time to work on their posts. Mark you calendar to head over to GoPetFriendlyBlog dot com right around the end of the yearto get all the details for next year's Challenge. There do tend to be more dog bloggers - but pet bloggers of all varieties are welcome. I hope to see you there! By the way, consistency is an important part of blogging and something I need to get back to this year. As for your question of whether to migrate to WordPress all I can say is I really like WordPress, but I know very little about Blogger. I did evaluate both platforms when I first started blogging in 2007, but besides that I haven't done much with Blogger. Congratulations on the release of your book, Lisa! What a fantastic accomplishment. I've had an idea ofr a book for years, and just can't seem to find the time to get it done, so I applaud your determination. 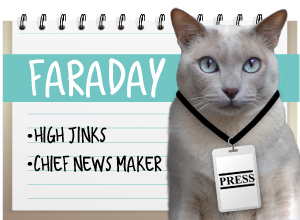 And, that peemail from Faraday is one of the funniest things I've ever seen. 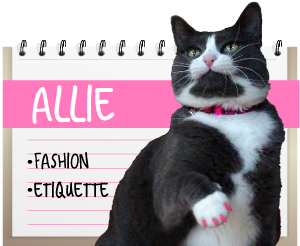 "Allie hissed at me 5 million times" ... too funny! I don't have any experience with Blogger, so I can't compare, but I love WordPress. I find it easy to use and love all the cool widgets and plugins that it offers. It's a big decision, and if you decide to jump, I wish you the best. Thanks so much for joining the Challenge this year!